Here are some of the latest and greatest 2019 birding apps for iPhone, iPod Touch, iPad and Android. Three that stick out among the competition are the iBird Pro, the BirdsEye and the Audubon Field Guide to North American Birds applications. Interactive field guide for every species (924) found in North America, Canada, Hawaii, and all coasts and islands, even extinct birds! "Being able to search by pattern is a killer feature. Search by length, weight and wingspan has revealed things about birds I was never aware of like being able to find the birds that have the widest wingspan or longest length. Also, thank you for letting me now sort the families by alphabetic as the taxonomic search really was confusing to me. But my favorite feature is almost an afterthought - share to hear a bird sing and see its species page. I'm using that feature to teach my daughter how to identify birds by their song and its just really fun." 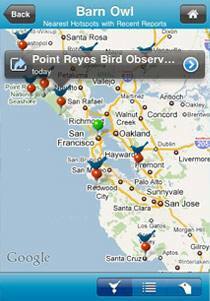 -BlackRail (iBird Pro Guide App is also available for Android). Those of you who are Peterson guide birders will especially enjoy this app. Several reviewers have said they like it even better than having their field guide book, especially that you can instantly listen to songs in addition to viewing identification details. It does not have photos of the birds, but has Peterson drawings instead which I think is always better for bird identification. Every species is shown perched and in flight from above and below. Shows every major seasonal, age, and sexual variation. Detailed coverage of subspecies and regional variations. Detailed maps showing not just winter and summer range but also migration and rare occurrence. Detailed descriptions of songs and calls, comparing similar species measurements of length, wingspan, and weight for every species. One-tap enlargement of images and rotating the device expands images further. Over 2300 carefully-selected and edited sound recordings. Nearly all species are represented with multiple examples showing the range of vocalizations. The ability to compare any two images, maps, or sounds, side by side on the screen. The ability to filter by state/province, so that you see only the species likely to occur in your location, and to further reduce the possibilities to the most common birds in that area. "This is just like my field guide but now on my phone. The sibley guide is the best guide in print, and now its the best on a mobile device." - MikeSears (Sibley eGuide App is also available for Android). For those of you who prefer photos of birds for identification over drawings (which we personally do not), you may like the Audubon app better than the Peterson, National Geographic or Sibley apps which do not have photos, but drawings. The iBird Explorer Pro has both and would be our choice if you wanted photos. "Unlike others, I have found the search features to be extremely helpful. The search will find, for example, all the gulls. If you type in the word 'gull', it instantly tells you your search matches 27 birds, If you press the 'Birds' button it will take you to where you can scroll through all 27 gulls. 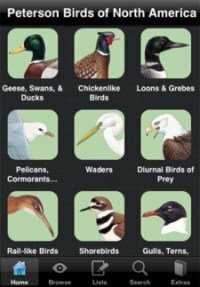 This app would be a nice companion to the National Geographic's Field Guide to the Birds of North America, for those who prefer it over Peterson field guides, and/or instead of when you didn't have your guide book with you. It's also priced relatively cheap. The search function seems to one of the highlights of this birding app, though we think Peterson's app is better at the same price because of added functionality and features. Over one million bird observations each month reviewed by local birding experts. 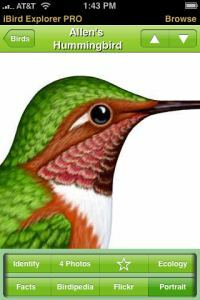 For the 470 most observed North American birds (377 additional bird content can be purchased separately) there are photographs, songs and calls and Kenn Kaufman's notes about the species. "What makes this birding app for iPhone so extraordinarily useful for identifying birds is that it shows you the birds that have been reported near your location within the last several days. 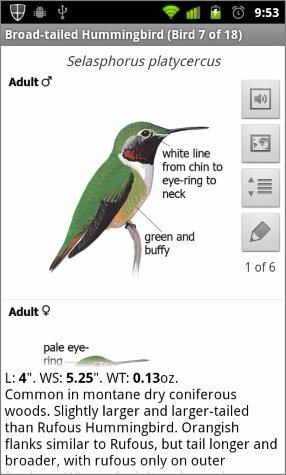 This narrows the range of possibilities and, combined with the beautiful and detailed bird photos, allows for rapid identification. It also gives you the locations of nearby hotspots that are open to the public and tells you what birds have been spotted there recently. 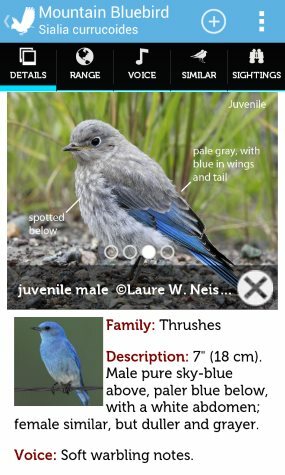 We think this would be a good app to have in addition to one of the other birding apps on this page which are more for identification purposes. BirdsEye would be especially useful when you are traveling and want to see new species in locations you aren't as familiar as your home town. Bird Codes is a simple birding app to help you learn the four-letter bird codes, aka alpha codes or banding codes. Good when recording birds in the field and unsure of the proper code. You'll also now know what other birders are talking about in forums, blogs, bird alerts, birding email lists, etc..
Easy to use app, only 99 cents! On a side note, for those banders or ringers out there, there is a free Band Codes app that in addition to the 4-letter banding codes also provides band size as a back-up, double-check. It also gives notes when banding certain species. This one is free, but does not have all the AOU species as mentioned above. 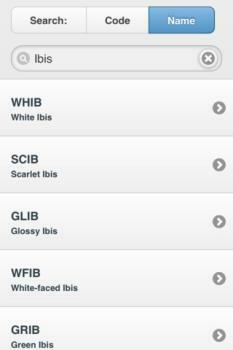 So if you are a birder, not so much a bander, get the Bird Codes app. 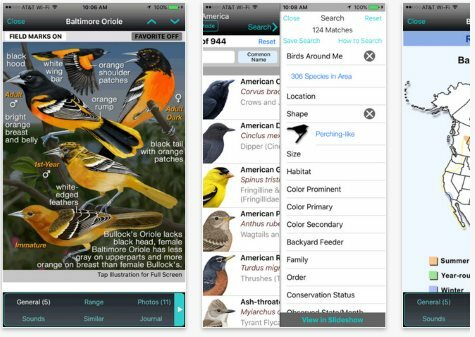 Whether you are a beginner bird watcher or an expert ornithologist, any of these six birding apps for iPhone, iPod Touch, iPad or Android device would be a great addition to your birding knowledgebase that is extremely portable. All six, we believe, are bargain prices for the amount and quality of information you receive about birds for your mobile device. Choose the app that best suits your learning style and the kind of information you would prefer most. Happy Birding! Bird Identification - Need help with Bird ID? Wild Bird Identification - Tips for identifying birds by sight and song. Best Bird Field Guides - Which are the best field guides? Bird Song Identification - Learn to id birds by song alone. Bird Watching Tips - More birding tips 'cause you can never have too many!